This year, the banned books committee will highlight graphic novels since Captain Underpants and Smith's Bone series are in the top ten. Many events will be taking place across the nation and also the blogosphere as people take to the internet for a virtual read in of banned books. Check out the American Library Associations website for all activities and lists relating to most challenged books, including classics such as The Great Gatsby, The Grapes of Wrath, To Kill a Mockingbird, Ulysses and All the Kings Men to name a few. 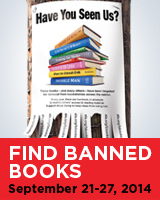 Join me in reading a banned book or two or three this month. I was out of town from Friday on and didn't get my entry in before this expired. Here's my Week 37 book: The Sittaford Mystery by Agatha Christie.